What's your favorite thing about clowns? Their silly antics? Their funny jokes? Their... cheerful smiles? Use these nasty teeth to create a truly creepy carny, or just about any other bone chilling character you can think of. 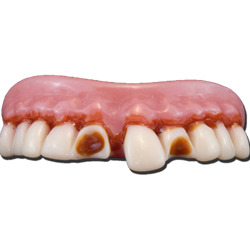 The Billy Bob Psycho Clown Teeth include one set of faux teeth and heat activated molding pellets for a custom fit.